I’ve come a very long way from my very first bento and actually, probably my first 100 bentos. 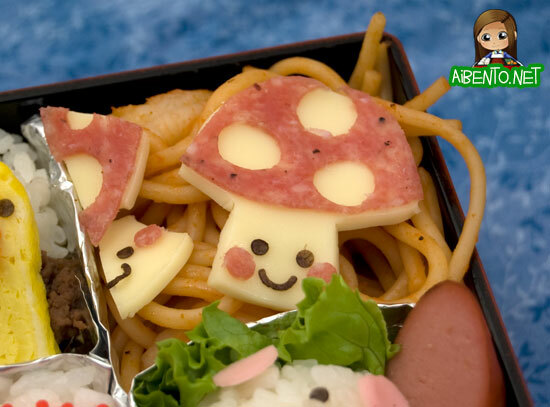 People who have read my blog from the start might not remember, but I used to rarely post cute food. Since I was going Weight Watchers, I stuck mostly to just arranging my food neatly. Eventually, I hit my 100th bento and I think that’s probably around when I started getting pretty addicted to actually making cute and not just looking at cute. 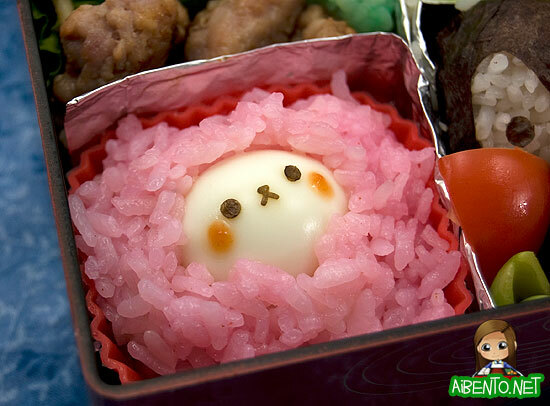 For my 200th Bento, I did a Sanrio theme. 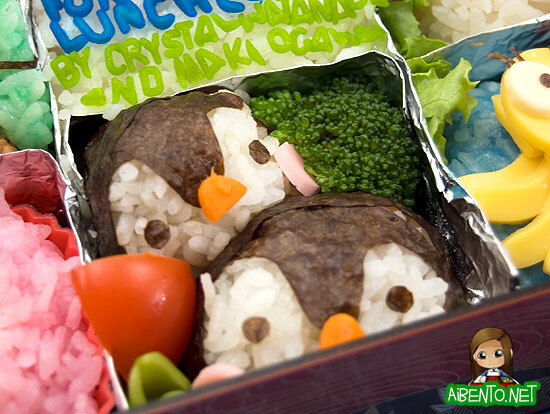 When I got around to 300, I spent literally all night making my Noah’s Ark Bento, which to this day is one of my most popular creations. 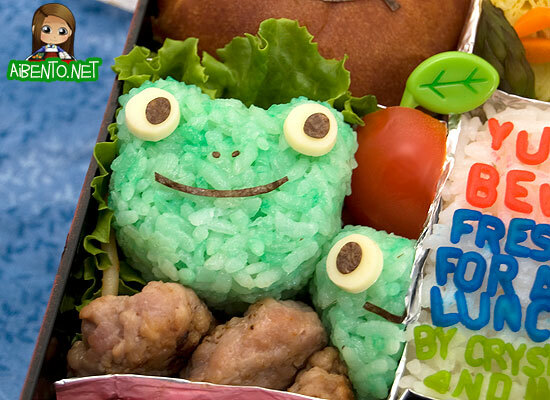 I had intended my 400th bento to be my Shantotto bento for the FFXI Fan Art Contest, but I miscounted and a sandwich bento ended up as my 400th by accident. 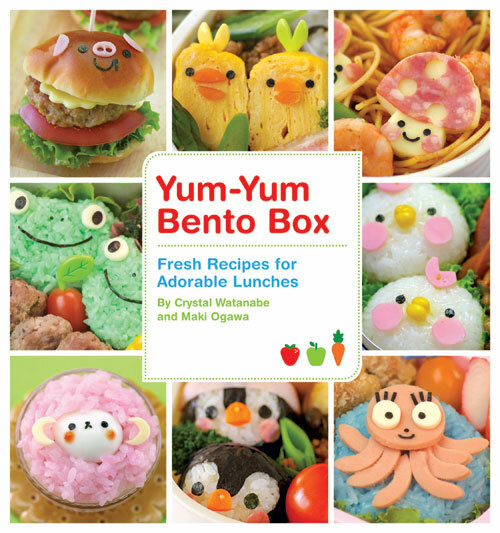 Today, I finally got around to making my next big milestone bento and I chose to make it none other than the cover of my bento book, Yum-Yum Bento Box: Fresh Recipes for Adorable Lunches , which is now “In Stock” at Amazon.com!! As you can see, I had the most trouble with the middle, as I couldn’t possibly do letters that small. 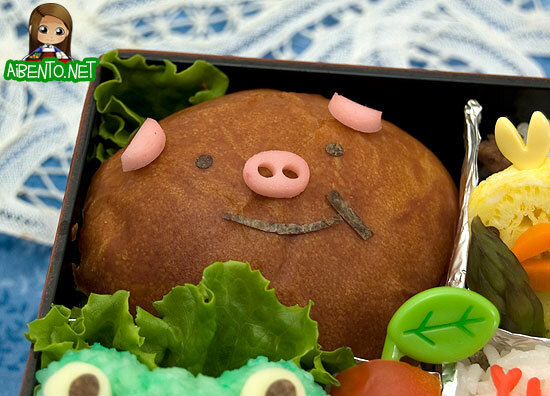 Anyway, let’s start with the piggie burger. A little cheeseburger with a pig face on the bun, he makes up the top left corner of my lunch. Unfortunately, you can’t see the underside of him. He’s topped with fish sausage and nori. Next to the piggie are the little tamagoyaki chicks. 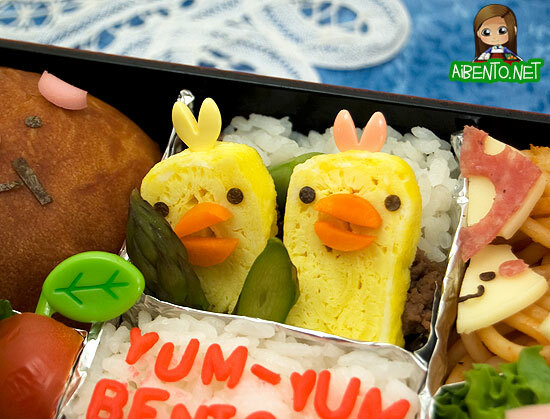 This bento doesn’t actually have its own page, but it’s there as a side image to show you something else you can do with our tamagoyaki recipe. Next up I have the little toadstools. Maki used a cute cutter for this, but I don’t have it, so I drew my own on paper and cut it out with a toothpick. I used a straw for the holes and cheeks. It tops shrimp spaghetti. Below that are the chickens, who have little kernels of corn for beaks and fish sausage cheeks. My rice was drying out at this point, so they’re a little “feathery” in my lunch, haha! 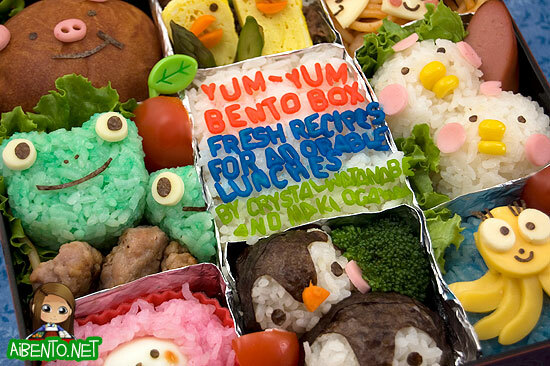 I’ll just call it bento “special effects”. 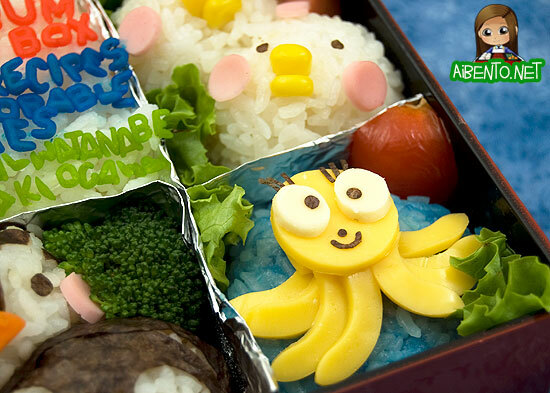 A milestone bento wouldn’t be one without me being a dingbat, right? I forgot to buy bologna, so I used cheese for Miss Octopus instead. 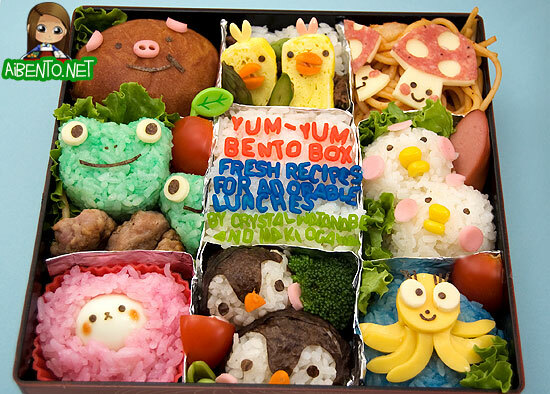 Half of the bentos in the book are ones I’ve never made, because Maki made her designs in Japan. These penguins have always been rather intimidating for me, but we have a pattern on the recipe page and I used that and viola! Penguins! It was extremely easy and such a relief too. I had thought I’d mess these up so bad. This little lamb got it’s own page, but is just a component, so she’s great for sticking into any of the other lunches we have designed for you in the book. Last of all are the froggies with pork patties. As you can see, I had to cut one in half, haha! That was amusing, but with a butter knife, it went pretty smoothly. Anyway, lunch break is over now and I’ve only eaten a couple of sections. The rest will go home with me for the kids to eat! Hopefully I don’t reach 600 too soon because damn these are exhausting! Hopefully this inspires some of you that weren’t sure about the book to take the plunge and buy one! It’s just $11.43 on Amazon. I’m still scheduling book signings, so when I have a full schedule I’ll be sure to post that for everyone.